I happened to read that Shake Shack is serving Game of Thrones' themed burger and shake for a limited time only at Madison Square Park location. 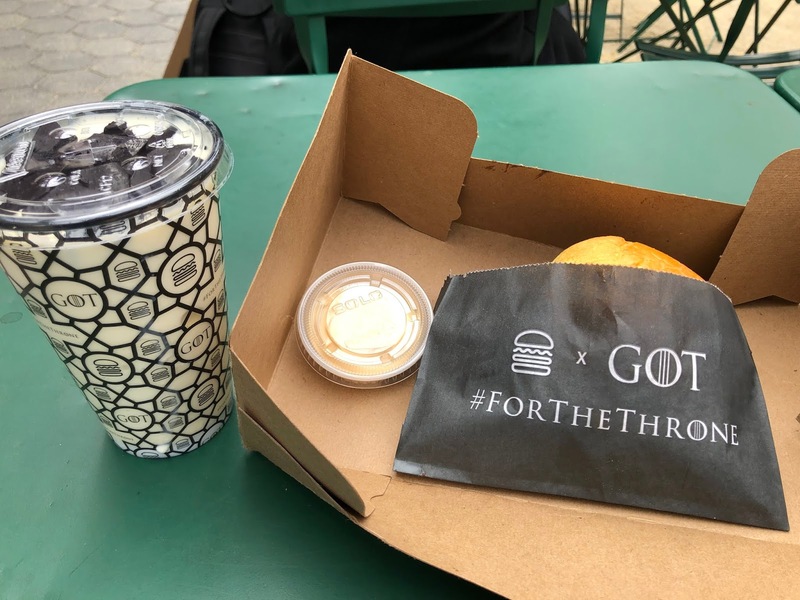 The burger is called Dracarys Burger (Dragonfire Burger) and the shake is Dragonglass Shake. 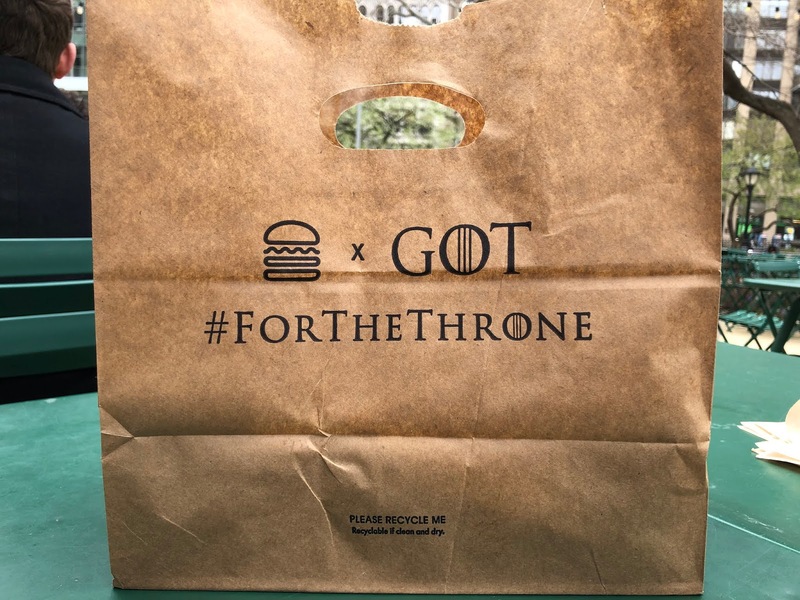 I don't watch the show because it's too complicated and too many names to remember, but I was interested in trying these items solely because they're labeled as limited. 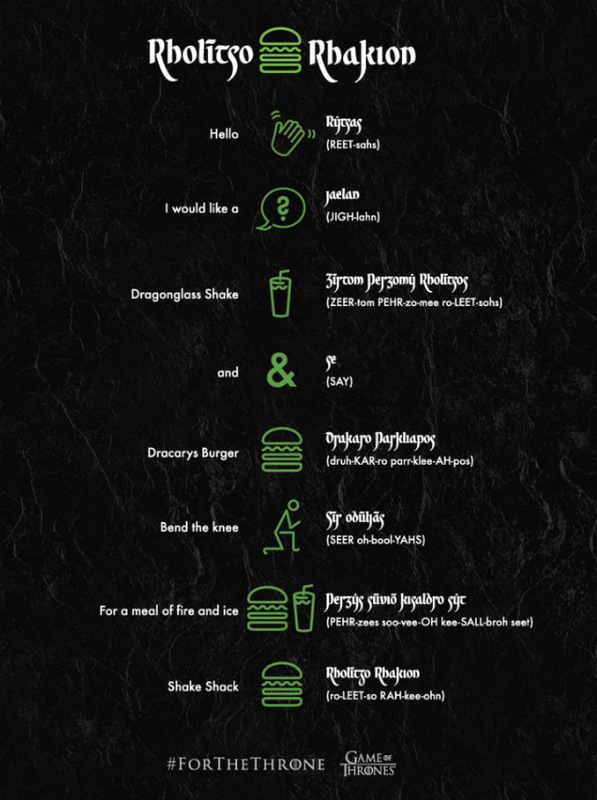 I was gathering some information beforehand, and apparently I have to order these items in Valyrian, the fictional language used in the show. 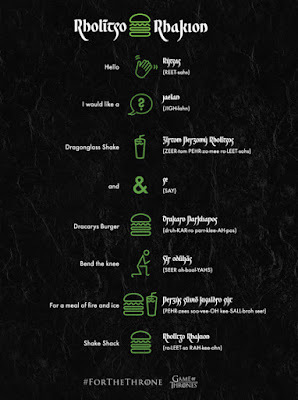 There's a little guide that has phrases to use when ordering with phonetic symbols, and I practiced a bit before going to the location. 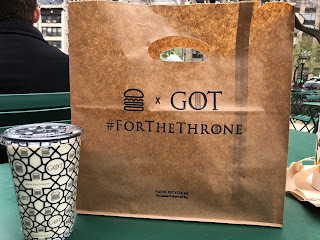 When I got to the Madison Square Park location, there're board advertising the GOT products. I proceeded to the order counter and was ready to order these in Valyrian, but when I first said, "I'd like Game of Thrones' themed items," before ordering in Valyrian, the cashier typed my order in. 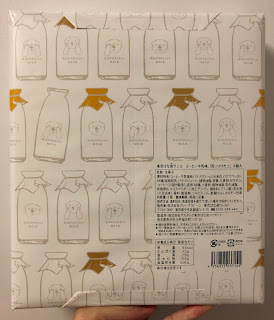 So... basically I didn't have to speak that not-so-familiar-to-me language though many sources said I had to. 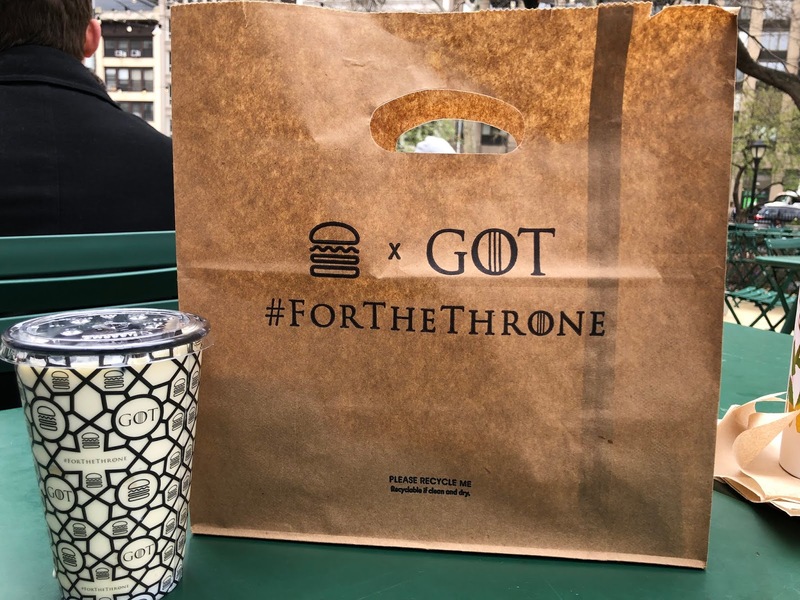 It's not busy at all, but my order was ready in about 10 minutes. 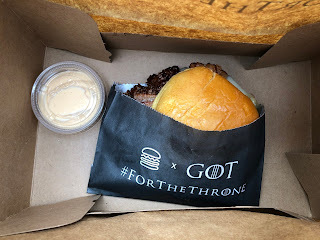 I asked the sauce on the side because Shack Sauce tastes like mayo to me (I hate mayo so much). 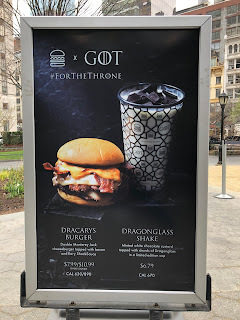 Dragonglass Shake and Dracarys Burger. The bun was regular ones that they use for burgers. 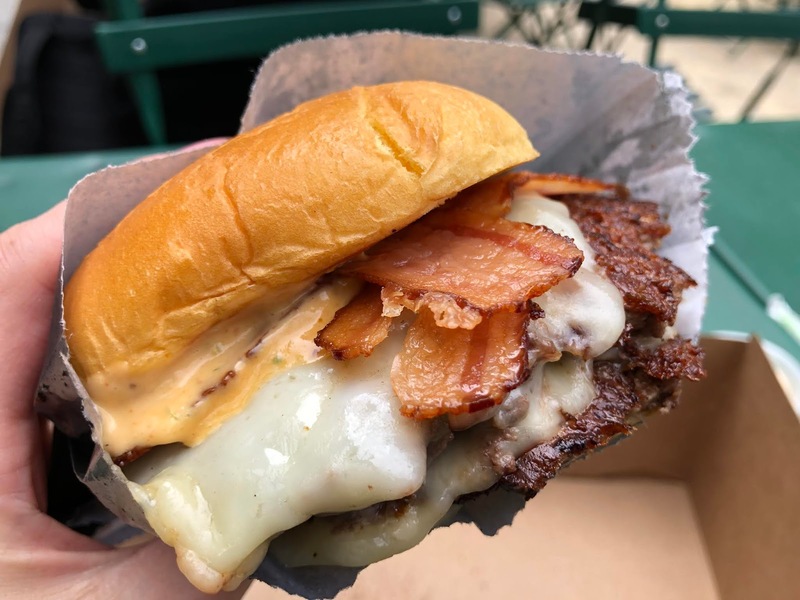 It's a double cheese burger with Monterey Jack, 2 strips of bacon and spicy Shack Sauce. 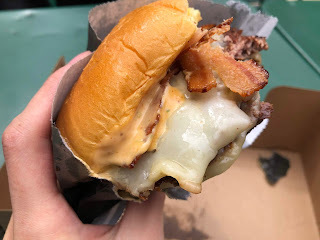 The patties had crunchy, crispy surface as usual, and melted Monterey Jack cheese looked tasty already even before trying this burger. The spicy Shack sauce was put generously, and I hoped it wouldn't have strong mayo flavor. 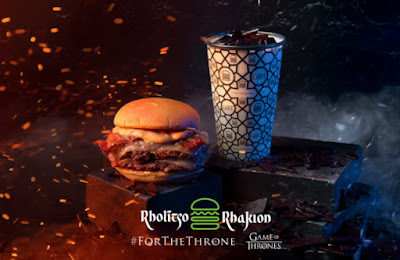 The spicy sauce was much spicier than I thought but not fiery enough to make me cry or spout fire like the name, Dragonfire Burger. 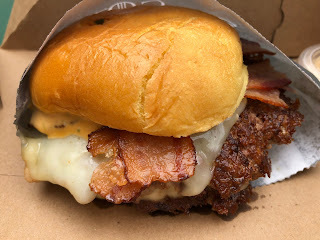 It had some smokiness like chipotle but that might have been from the bacon. 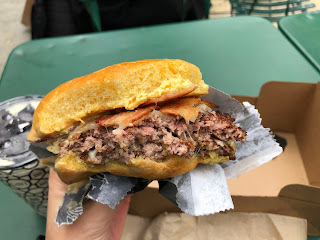 The patties was juicy and the soft bun was fluffy, and I wish the bacon strips were crispier as they're a bit soft and lightly hugging the patties. A week ago, I had a cheeseburger at Shack Shack but very disappointed at the taste and quality since everything was greasy and not properly made to our order, but at least this one tasted better than that last burger. 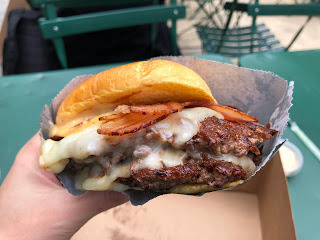 However, I mainly tasted the spicy sauce from the beginning to the end while I kind of tasted some meat, which isn't my ideal type of way to enjoy burgers; I want to have a good balance of meat, bun, cheese, and veggies if there are, and I think they could have made this somewhat better with or without the spicy sauce by adding, for example, a slice of jalapeño or fired-colored sauce. To me, this burger was "ok" because of the overpowering spicy sauce. 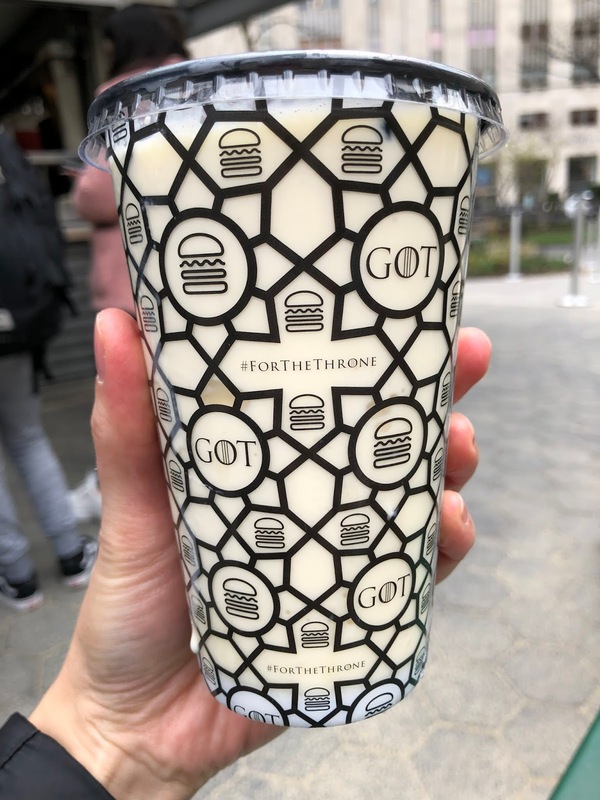 It's served in a special limited cup. 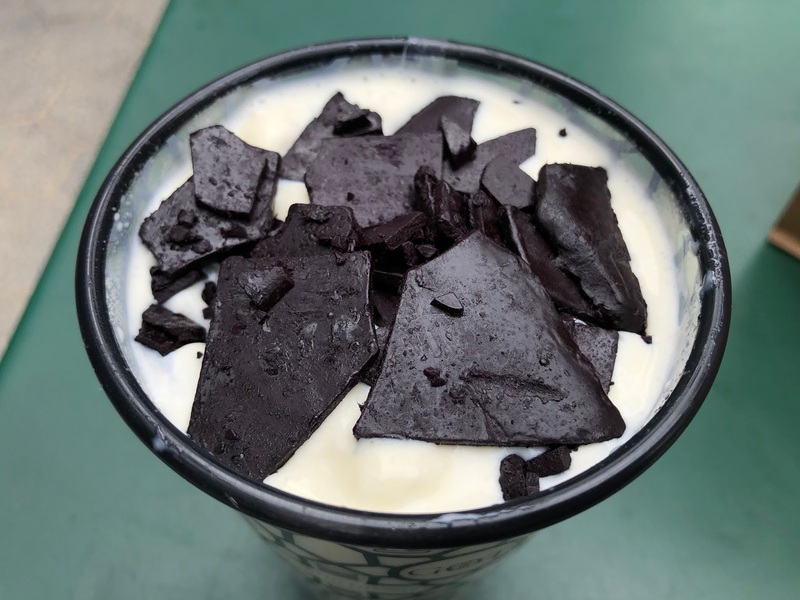 It's a chocolate mint frozen custard topped with shards of Dragonglass. I thought it'd taste similar to ordinary chocolate mint ice cream, but the fresh mint scent was so subtle that those who don't like chocolate mint would be able to drink this. Time to time, some sweet crunchy pebbles came through the straw. 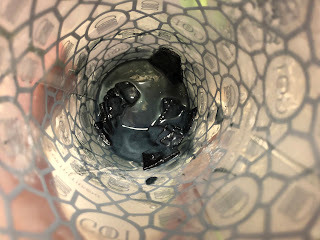 The dark black Dragonglass didn't come through the straw as you can see, and when I had some of the pieces afterwards, they stuck on my teeth pretty badly. 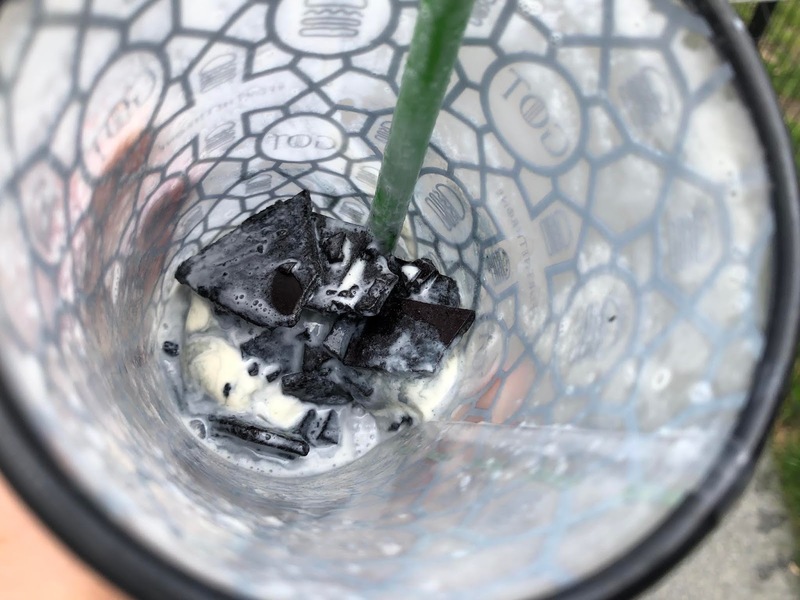 And they're rich black and my tongue got black, too. 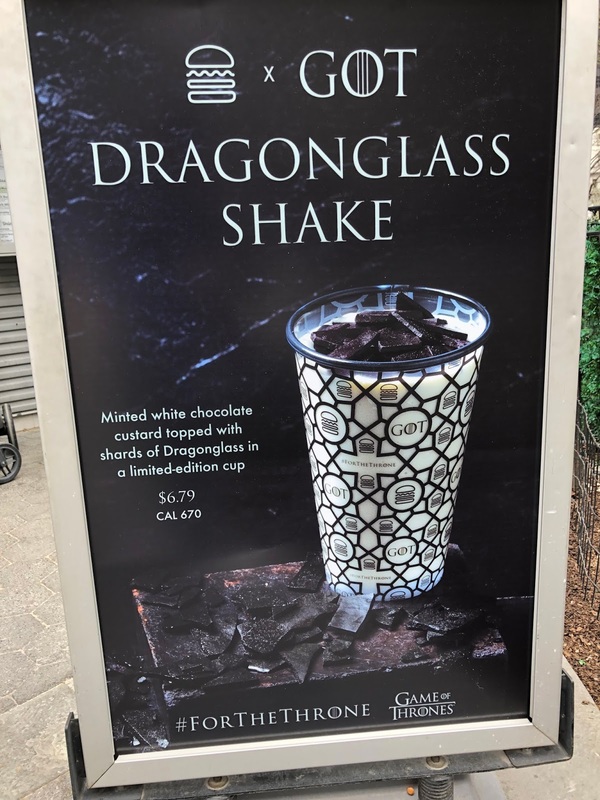 It's unfortunate that the toffee (Dragonglass) didn't get mixed with shake, but this shake was much tastier than the burger. Dracarys Burger will be available till April 21st and the Dragonglass Shake is sold till May 19th. 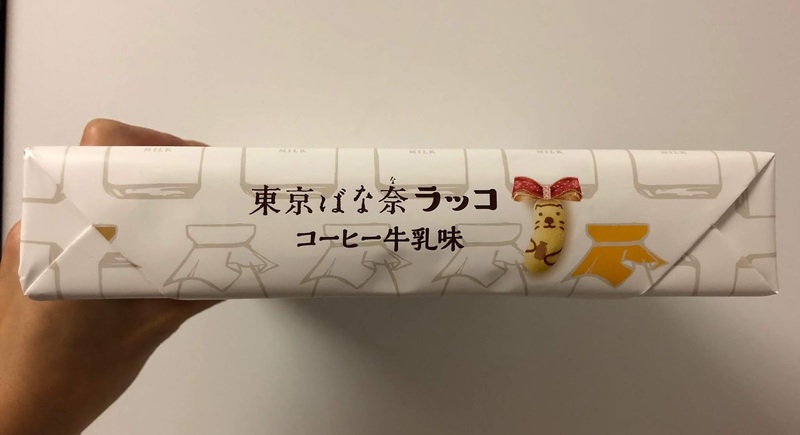 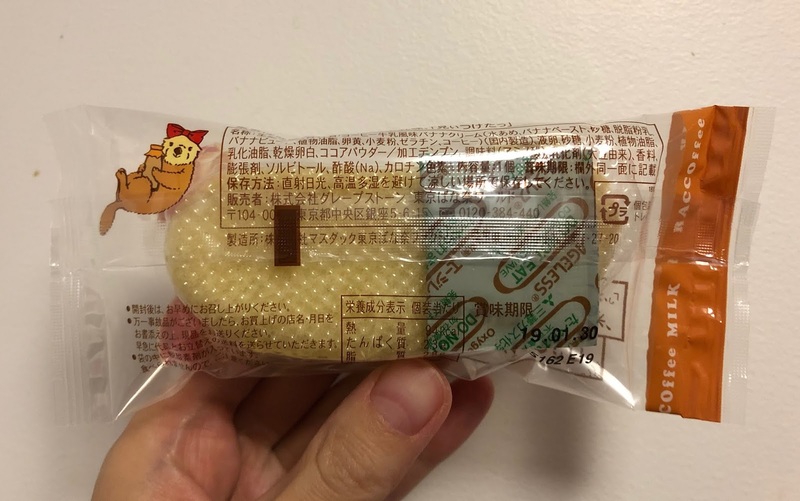 A new and fall-winter only flavor for Tokyo Banana was launched on October 3, 2018, and it's coffee milk (cafe au lait) flavor. 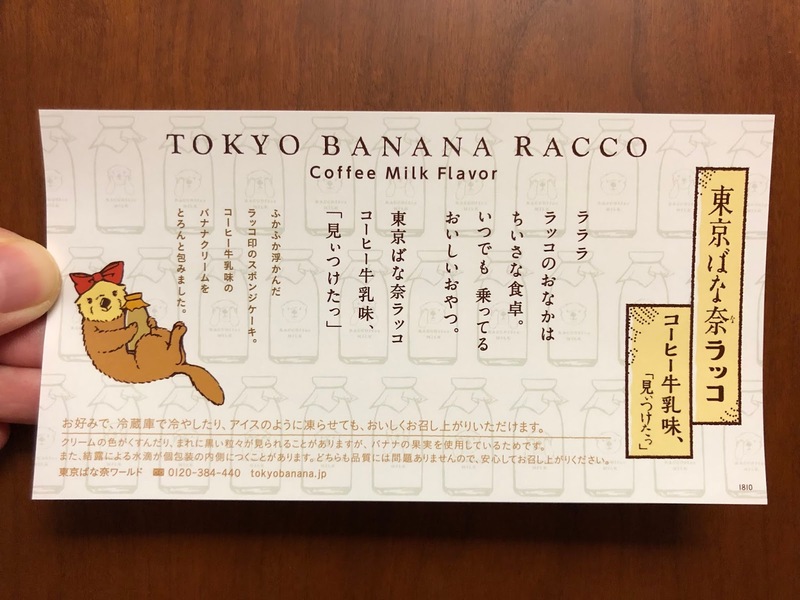 Tokyo Banna Racco Coffee Milk Flavor is the actual name, and Racco is otter in English. 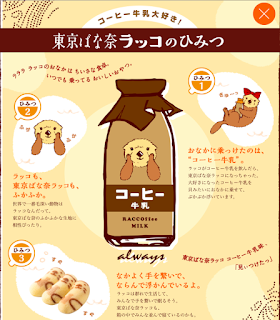 I had no idea, but October 1st is Day of Coffee, established by All Japan Coffee Association. 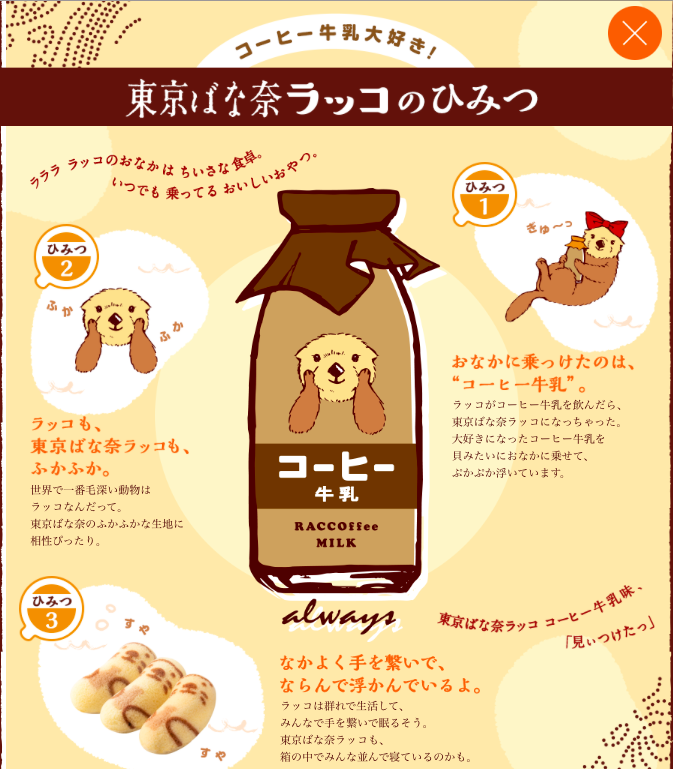 All over the paper, there're traditional glass bottles for milk and coffee milk with otter face. 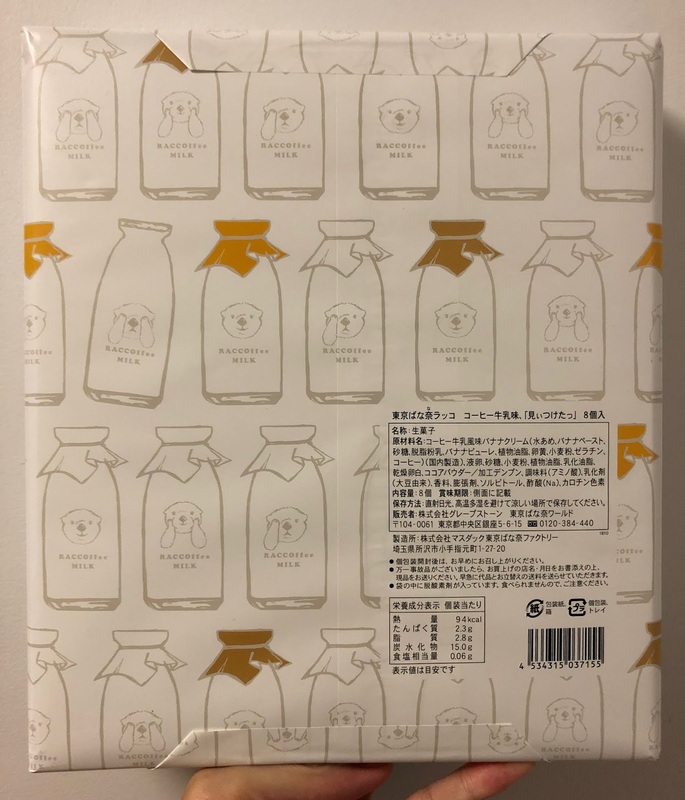 Under the paper wrap, the box was very simple. 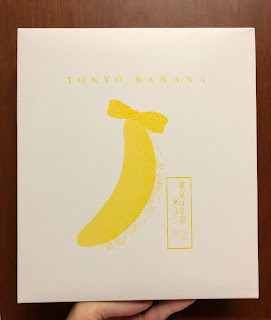 On the homepage, there's a "Secret of Tokyo Banana Racco" page. 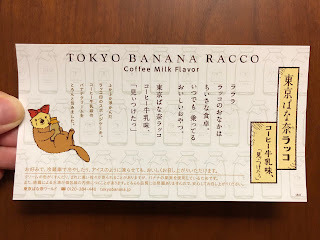 The racco is holding a coffee milk bottle on the stomach. 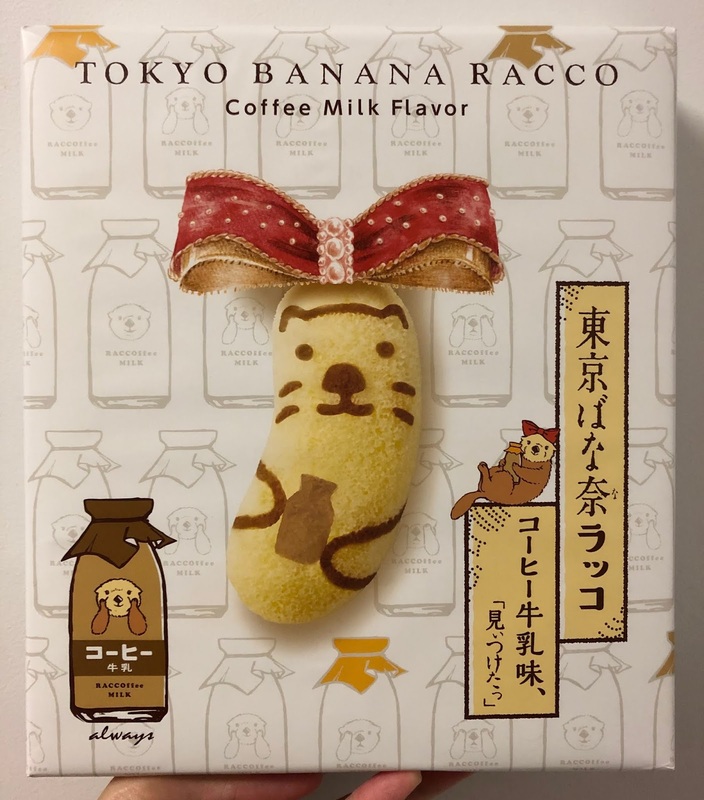 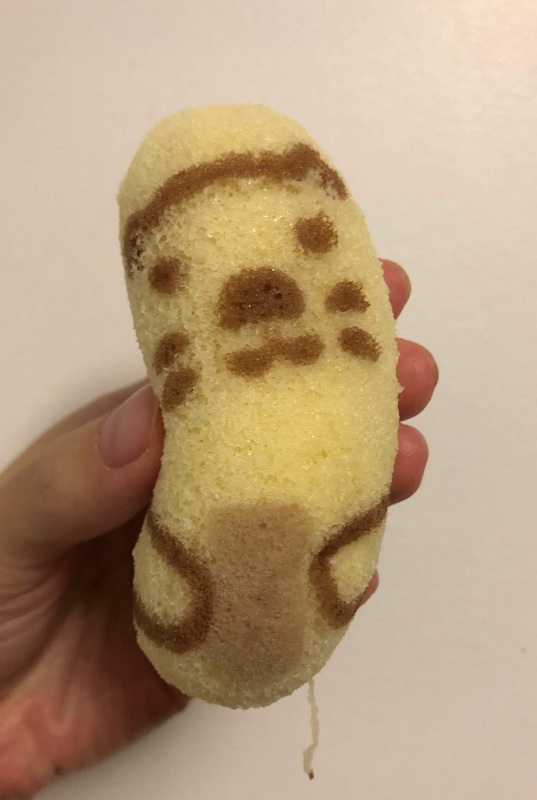 Tokyo Banana Racco holds a bottle of coffee milk on its stomach as if holding a shell. 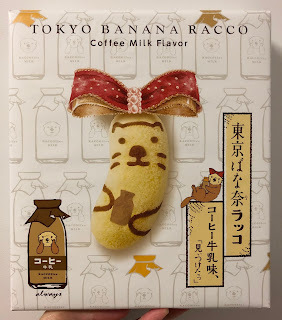 Otter and Tokyo Banana Racco are both fluffy. 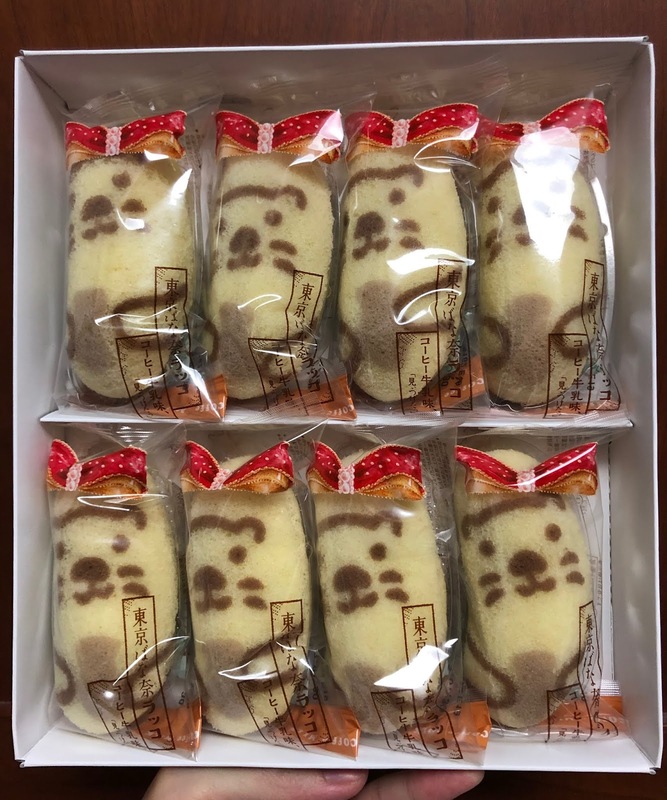 The world's hairiest animal is apparently otter. 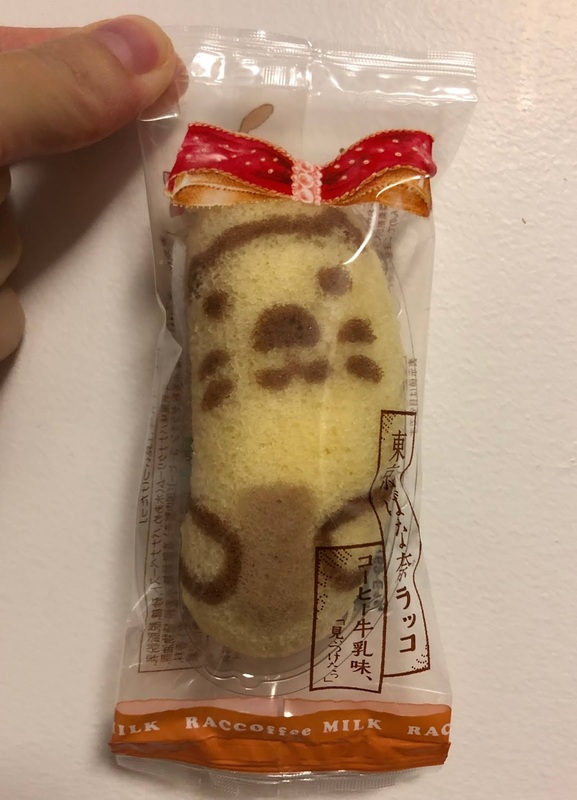 They're floating together hand in hand. 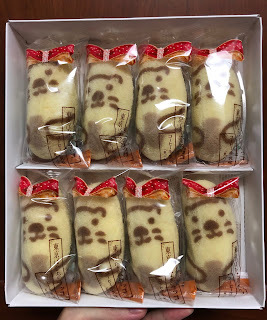 Otters live in groups and they sleep holding hands each other. A leaflet in the box. La la la Stomach of Racco is a tiny table. There're 8 Tokyo Banana Racco in the box. They're individually wrapped in a pouch with red shiny ribbon print on top. 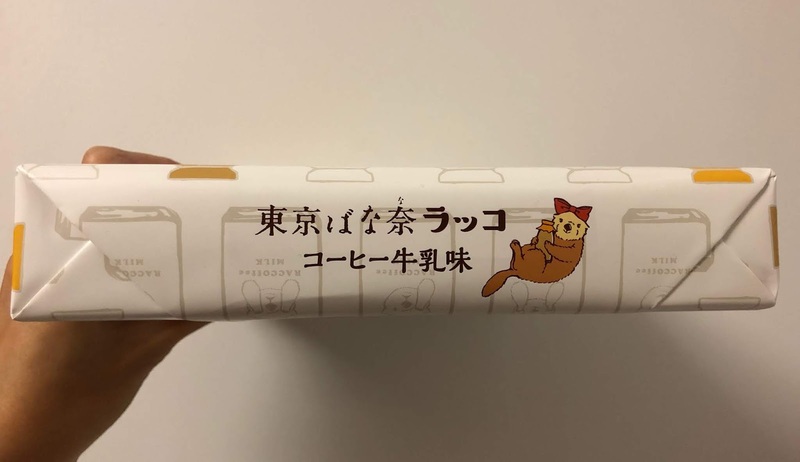 On the back, there's an otter wearing a red ribbon and holding a bottle of coffee milk. It had tiny ears on top, then face, and 2 hands holding a bottle of brown bottle = coffee milk. The cream had light coffee scent, but the coffee milk flavor was sweet and banana flavor was quite strong. 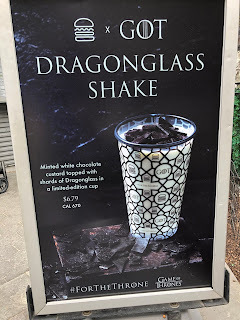 I wish it had more fragrant or some bitterness of coffee. 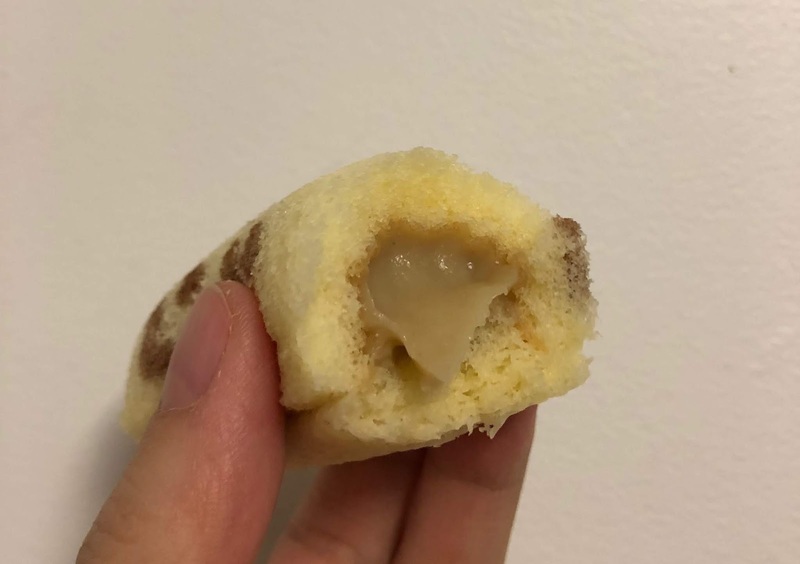 However, as the filling had some coffee, the aftertaste was lighter than that of original Tokyo Banana.